Meet the newest and hottest style of sandwich from Japan – Wanpaku Sandwich or Wanpaku Sando for short. Stuffed with colorful vegetables and layering ingredients, these solid Japanese sandwiches present endless possibilities! Probably one of the epic sandwiches I’ve ever made. 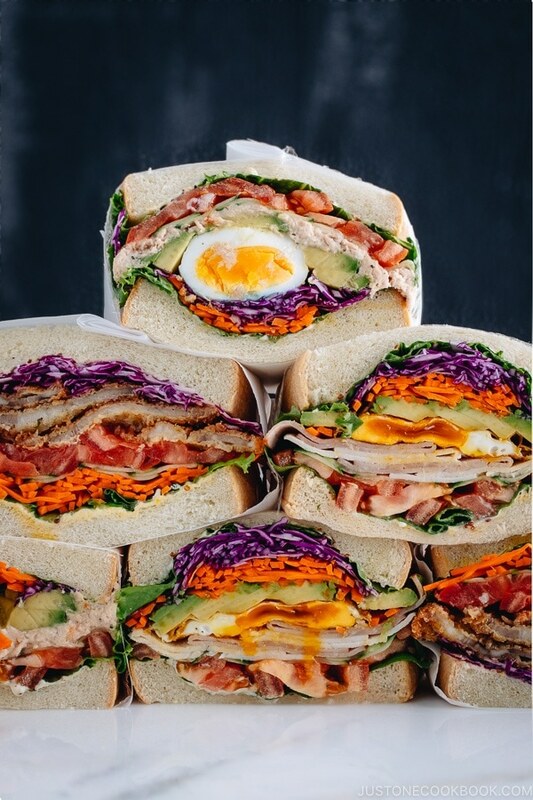 Have you seen pictures of these ultimate sandwiches on social media that they don’t look like they would fit in your mouth? Let me introduce to you – Wanpaku Sando (わんぱくサンド) or Wanpaku Sandwich, the hottest sandwich trend that has been around in Japan since 2016. 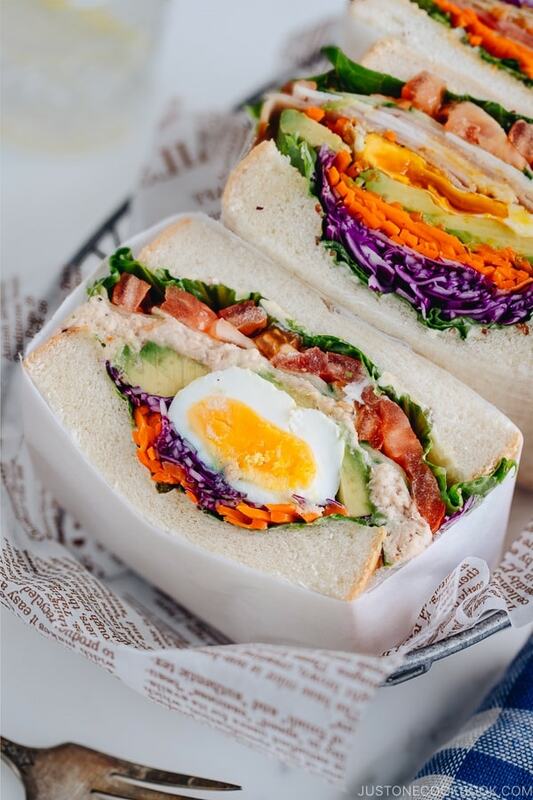 The glorious stacks of colorful layers and varying textures from meat, cheese, eggs, and fresh veggies all tucked in the pillowy Japanese bread shokupan waiting for you to take a big bite. 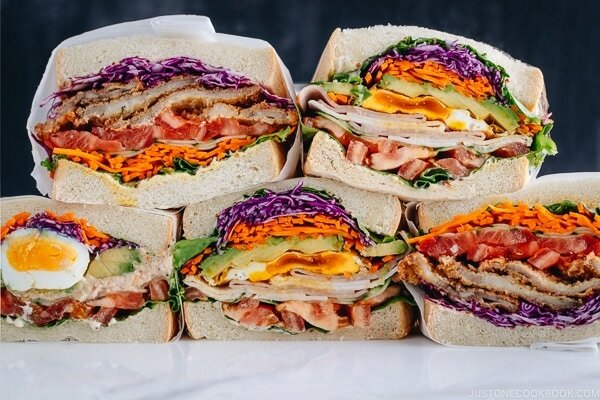 These have to be the best-looking sandwiches around. You know you have to make them now. 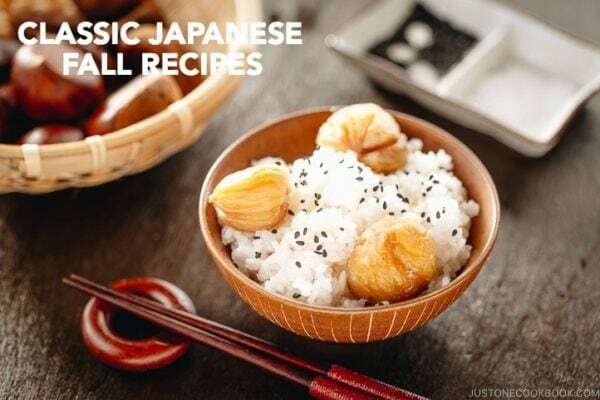 But wait, don’t forget to Instagram your creation and share it with #justonecookbook #わんぱくサンド! Meet the newest and hottest style of sandwich from Japan – Wanpaku Sandwich or Wanpaku Sando for short. Stuffed with colorful vegetables and layering ingredients, these solid Japanese sandwiches present endless possibilities! What is Wanpaku Sandwich (Sando)? “Wanpaku Sando” or Wanpaku Sandwich became hugely popular around 2016 in Japan. The word Wanpaku is often used to describe an energetic and mischievous or a cheeky person (especially a child), typically used in an affectionate way, like a rascal. I tried to look up on the internet on why this type of sandwiches is called “Wanpaku Sando”; but there weren’t many articles about it. 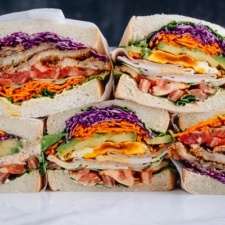 From the look of these bright, colorful, and mouthful sandwiches, no doubt they live up to the description of energetic and mischievous as if they were making cheeky faces. Wanpaku Sando wasn’t the first sandwich that triggered such a craze on social media. A similar thick sandwich had received similar attention on Instagram back in 2015 or even before that. This thick sandwich with shredded cabbage is called Numasan (#沼サン on Instagram). It follows the story of Yuki Onuma, a wife of a potter Michiyuki Onuma (aka Numao called by his wife), who makes the thick sandwich for her husband, which she named Numasan (a part of their last name “Numa” and “San” from sandwich). She had been sharing pictures of her Numasan on Instagram years before Wanpaku Sando became popular. Yuki has been making this sandwich for more than 10 years after she got married to her husband. He was actually the original creator of this sandwich filled with lots of cabbage because he wanted to eat more vegetables and cabbage was available all-year-around, easy to find, and inexpensive. Have you seen or made super thick sandwiches like these? When you make Wanpaku Sandwich, the focus is on the cross-section. When you cut the sandwich in half, the cross section should reveal colorful ingredients filled between the slices of bread. My recommendation is to pick four to five colorful ingredients including red, orange, yellow, green, purple, and white! See below for some ingredient ideas. Everyone makes their sandwiches differently, but my trick for a solid sandwich is to start from the flat ingredients – lettuce, tomato slices, cucumber slices, deli meats, cheese, and bacon – so you can level the ingredients easily as you pile them up. When you put a big ingredient such as a boiled egg, put it in the middle of the layers. Then on top of the big ingredient, you will need more flexible ingredients such as shredded cabbage or carrot salad to fill in the gap created by the big ingredient. 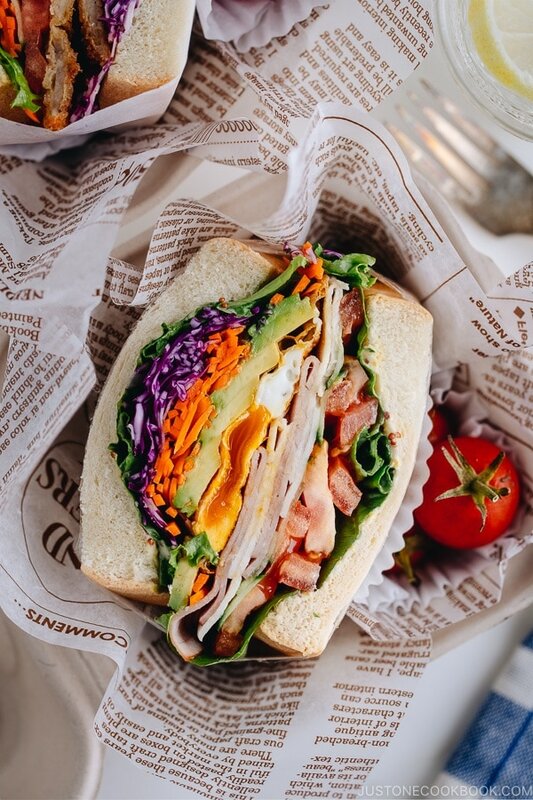 Just like art-making, the color composition also plays a big part in making sandwiches like this. 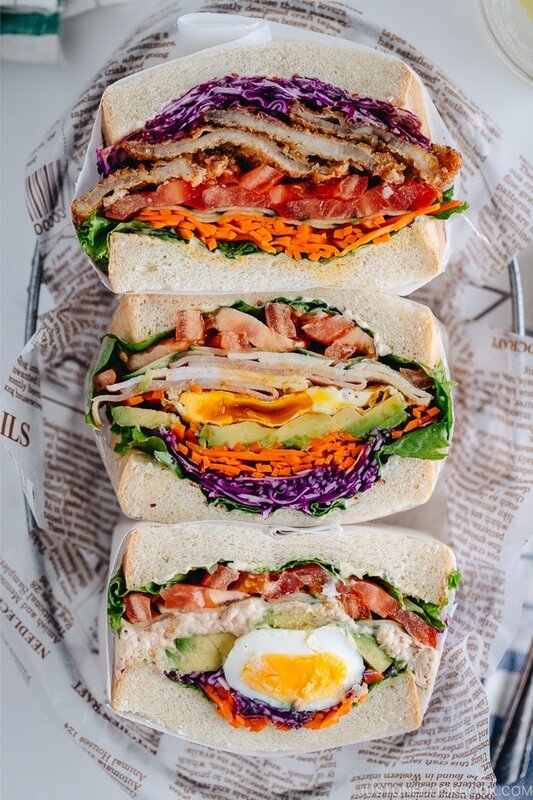 The cross-section of the sandwich should showcase the range of colorful ingredients. If you use a few green or red ingredients, make sure each color alternate, so it will at least look green, red, some other color, green, red in that order. It’s important to decide what ingredient is the center of the sandwich. If I use a boiled egg, I make sure to put in the center/middle of the sandwich. If you have some “feature” ingredient, make sure that comes in the middle too! For a sturdy sandwich, you need to pay close attention to the cross-section. Before you start building the sandwich, which direction are you going to slice the bread? You need to lay down the ingredient based on the orientation of the cross-section. That way, when you slice the bread in half, you will see the avocado nicely stacked up, or the egg yolk of the fried egg is perfectly cut in half. It’s so important to wrap this thick sandwich properly; otherwise, the ingredients may slide out while wrapping, or pop out easily when you’re eating the sandwich. In the recipe, I will show you three wrapping methods; with plastic wrap (more flexible), parchment paper (pretty), and both (for beginners but want the parchment paper look). To make a hefty sandwich like Wanpaku Sandwich, the best choice of bread is thick, soft bread like Japanese milk bread, Shokupan. Shokupan (食パン) is a white and pillowy square-shaped milk bread with a soft crust. The texture is soft yet bouncy, and it’s a common everyday toast for breakfast in Japan. Japanese or Asian (Korean/Chinese) grocery stores sell this type of square-shaped milk bread. For Wanpaku Sandwich, we need shokupan which thickness is around 1.8 to 2 cm (3/4 inch). In Japan, shokupan is sold in a package of 4, 5, 6, 8, and 10 slices per loaf (with some regional preference on thickness). I’d go with the package with 6 slices. If you can’t find shokupan in your area, you can use bagels or thick slices of bread. One day I’ll share a homemade shokupan recipe! 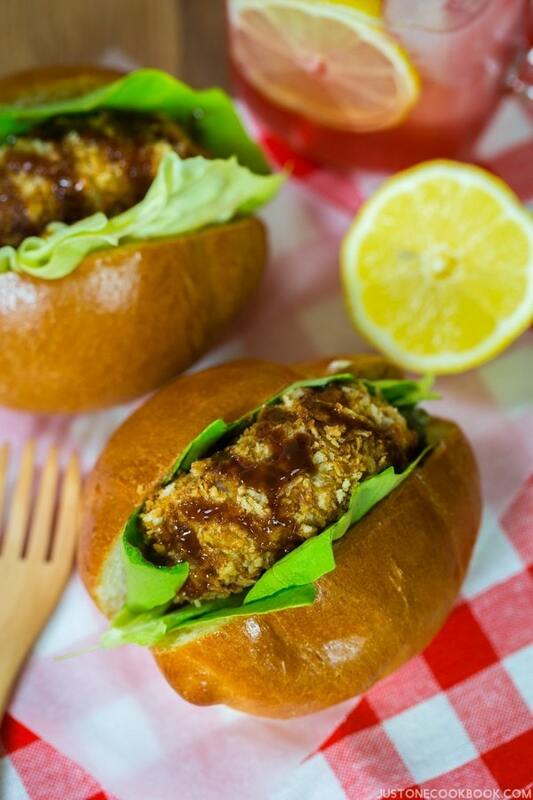 No matter how you make these Wanpaku Sandwiches, you know they would be great! Enjoy! Meet the newest and hottest style of sandwich from Japan - Wanpaku Sandwich or Wanpaku Sando for short. Stuffed with colorful vegetables and layering ingredients, these solid Japanese sandwiches present endless possibilities! Gather all the ingredients. You will also need plastic wrap or parchment paper (and some paper clips). Peel the carrot. Cut carrots into a fine julienne with the julienne blade of a mandolin, peeler, or a sharp knife. Cut in half or thirds if your carrot is long. Sprinkle carrots with 1 tsp kosher salt and rub and mix with hands. To make the vinaigrette, combine 1 Tbsp white wine vinegar, 2 Tbsp olive oil, ¼ tsp sugar, and freshly ground black pepper, stirring with a whisk. Add the vinaigrette to carrot mixture and toss to coat. Cover and let stand for 1 hour. Heat ½ Tbsp olive oil over medium heat in a frying pan. Crack an egg to make a fried egg as you like. Set aside. In a pot of boiling water, gently place the egg you just took out of the refrigerator. Cook the egg on gently simmering water for 9 minutes. Transfer the egg to iced water to let cool. Peel the shell and set aside. Drain the oil/water from canned tuna (if there is any), and season the tuna with Japanese mayonnaise. For this Japanese brand canned tuna, I used 3 Tbsp of mayo. Sprinkle the tuna with freshly ground black pepper and mix well. Taste and add a little bit of salt if necessary. Peel the cucumber with a peeler. If you’re using an English cucumber or American cucumber, stop peeling when you see seeds. Seeds get too watery in the sandwich, so just eat the center and don’t put inside the sandwich. 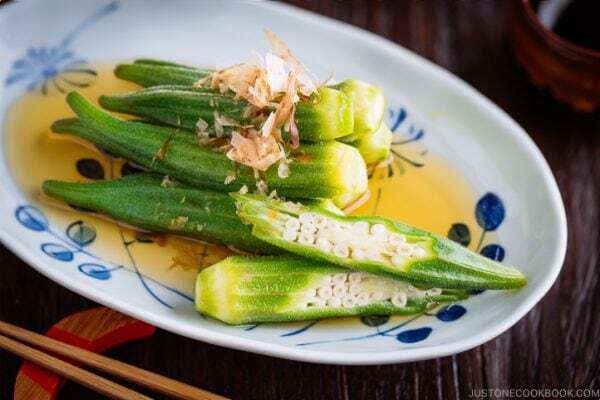 On a sheet of paper towel, place the cucumber slices to remove excess moisture. Slice the tomatoes and place on top of a sheet of paper towel and remove excess moisture. Thinly shred red cabbage with a cabbage slicer or a sharp knife. Cut the avocado in half lengthwise around the seed and twist to open. Hack the knife edge into the pit. Hold the skin of avocado with the other hand and twist in counter direction. The pit will come out smoothly. Cut the avocado into quarters. Remove the skin and cut them lengthwise into quarter inch slices. Clean your hands and knife with damp towel before working on another quarter. Carefully detach the lettuce leaf and rinse well. Again, carefully remove the excess moisture with paper towel. In a small bowl, combine 4 Tbsp Japanese mayonnaise and add 1 tsp Dijon mustard, stirring with a spatula. Prepare a large sheet of plastic wrap. The plastic wrap should be wide enough to fit 4 toasts. Now have a mental note that you will be slicing sandwich WIDTHWISE (slice in the same direction as the scissor indicates). Spread the mayo & mustard mixture on the bottom and top slices. Place the bottom toast in the center of the plastic wrap. I start with lettuce, tomatoes, and cucumber. You can start with any ingredients you like. Remember the tips I mentioned in the blog post. Flat ingredients should be at the bottom and flexible ingredients should be higher on the top. Fold and place the ham and turkey slices on top, and then fried egg and avocado slices. Keep in mind the “cut” line is WIDTHWISE. You have to always imagine how the cut line would look like. Put the grated carrot salad on top, followed by shredded cabbage and finally a lettuce leaf on top. Put the toast on top, mayo & mustard side facing down. Gently press down the toast with one hand and lift one side of plastic wrap to wrap around tightly. Gently and slowly pull down the plastic wrap as you go over the sandwich. This helps to tighten the sandwich and prevent the ingredients from falling off. 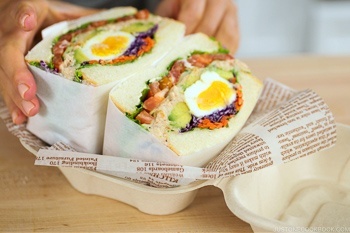 When the plastic wrap reaches to the other side of the sandwich, pull the other side of the plastic wrap, going over the sandwich and wrap around the sandwich so the seam line will be on the bottom of the sandwich. Now close the opening area by tightly wrapping around. Do the same for the other opening areas. Set aside for 5-10 minutes. Using a clean and sharp knife (I use a bread knife), cut the sandwich in half along the “cut” line. Prepare a large sheet of parchment paper; it should be wide enough to fit 4 toasts. 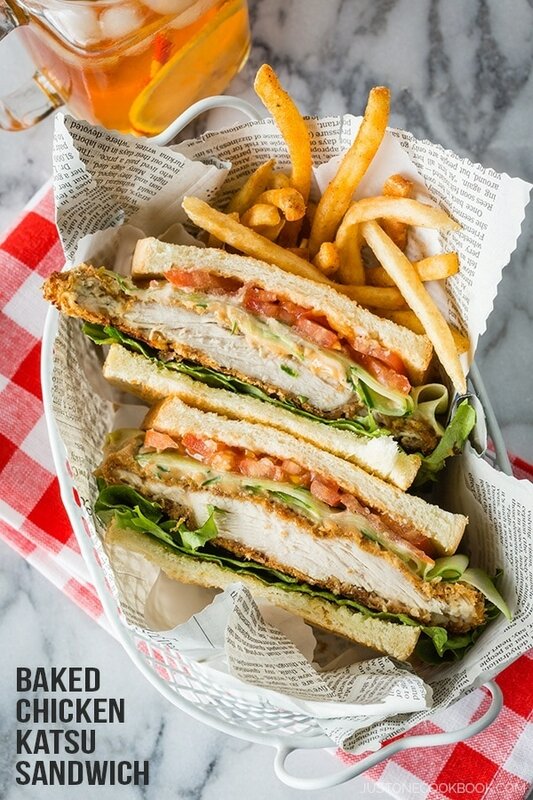 Follow exactly as the first sandwich above, but with thin tonkatsu (pork cutlet). Smear the mayo & mustard spread, followed by lettuce and the grated carrot salad. Next, sliced cucumbers, tomatoes, and thin Tonkatsu (pork cutlet). 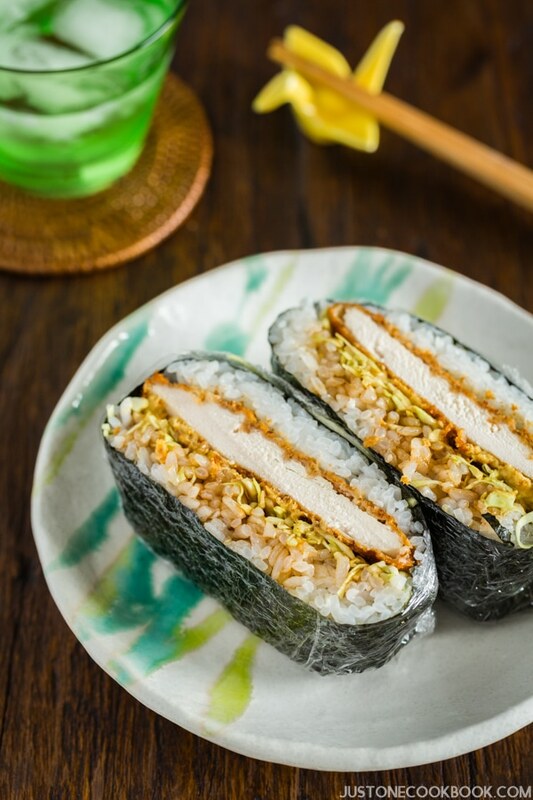 Drizzle Tonkatsu sauce, topped with shredded cabbage and then the top slice. Now with parchment paper, you will bring the left and right edges of the paper together over the center of the sandwich and line them up. Fold the joined edges down by half an inch and crease sharply. Continue folding in half-inch turns, creasing each time. As you fold the paper, gently press down the sandwich to make sure it stays in the right location. When the fold is flush with the surface of the sandwich, let it lay flat. Use paper clips to hold in place. Now we work on one side at a time. Press down the top paper, then form a pleated triangle (on working surface), creasing the triangle’s edges. Then curl up the triangle to tuck into the folds on the side. Repeat for the other side. Set aside for 5-10 minutes. 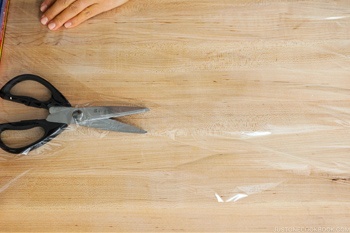 Prepare a large sheet of plastic wrap; it should be wide enough to fit 4 toasts. Follow exactly as the first two sandwiches above, but with tuna salad. Smear the mayo & mustard spread, followed by lettuce, sliced tomatoes, and cucumbers. Next, tuna salad, sliced avocados, and boiled egg. Then top with shredded cabbage, grated carrot salad, and lettuce. Place the top slice and gently press down as you wrap around the sandwich with plastic wrap, following Option 1 Method. Then use Option 2 Method to cover up the plastic wrap. It’s easier to wrap the sandwich as it doesn’t move. Here we go over the side. Press down the top paper, fold both sides to form a triangle on the working surface. Then tuck in to the folds on the side. Work on the other side. Press down the top paper, fold both sides to create a triangle, and then tuck in the triangle into the folds on the side of the sandwich. 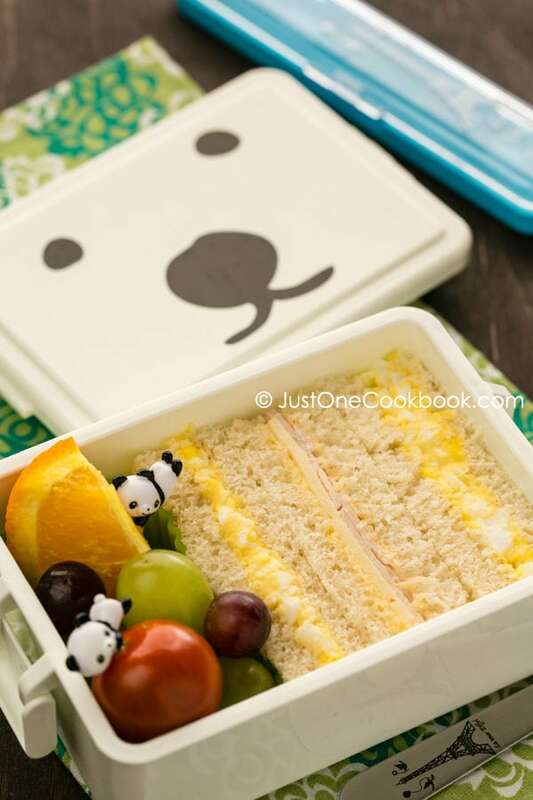 Use a square lunch box container or take out container to pack your sandwich. Make sure the sandwich stays tight so they will not loosen or fall apart. Crispy Tonkatsu: Recipe can be found here. Wow, that’s a ‘man-sized’ sandwich meant to be eaten with two hands. And, as always, the Japanese sensibility to organized planning in creating it and cutting it to maintain a visual aesthetic is evident. Thank you for sharing the idea and recipe. I look forward to watching the video. Hi nami they look amazing! just out of curiosity what size are the shokupan slices? height and width. thank you! Hi Matt! When I buy it again, I’ll double check. But I googled in Japanese and here’s the dimension. I like when food tries and defy physics’ laws. Amazing entry! Now, shokupan recipe. We need it. Asap. This is so making my mouth water. Can you talk a little about the best way to deal with the wrapping when you’re eating the sandwich? It seems like unwrapping it all at once would dump it in your lap, but obviously plastic wrap doesn’t tear off as you go the same way foil or the parchment paper would. Hi Gwyn! No, you don’t have that issue with plastic or parchment paper. I just asked Mr. JOC if he finds one is better or another and his feedback is same as mine. You definitely need to eat from the corner. As . you go, you kind of pull down the plastic/parchment paper. No tearing necessary. You need the wrapping to bind/hold the sandwich until you’re 80-90% done with. Never unwrap till toward the end. It keeps some ingredients falling (like a tomato or avocado slice). Hope this helps? Wow, that’s a BIG sandwich! And really colorful — love the way it looks. Fun stuff — thanks.